"I was one of the first world Leaders to call Trump after the elections. We agreed to meet." 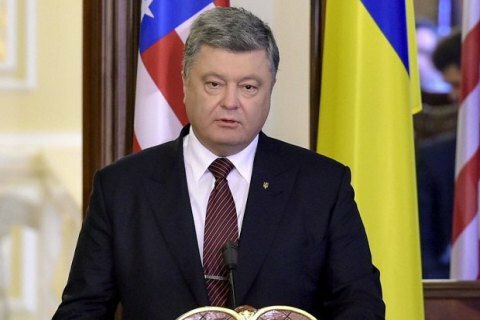 President of Ukraine Petro Poroshenko and US President-elect Donald Trump have agreed to meet, Poroshenko said in an interview with Bloomberg, according to one of the accounts of the Presidential Administration on Twitter. "I was among the first world leaders, whom @realDonaldTrump called the after elections. We have agreed to meet," the post reads. Late last year, deputy head of the Presidential Administration, Kostyantyn Yeliseyev said that the meeting between the presidents of Ukraine and the US Poroshenko and Donald Trump may be held in February 2017. In the US presidential election on November 8, 2016, the Republican candidate Donald Trump garnered the support of 30 states, against 20 of his rival Hillary Clinton. Poroshenko talked with Trump on the phone on November 15, 2016.